If you haven’t stopped by Café Comunión Coffee Shop across the street from Cobian’s Plaza, its about time you visited Santurce’s new celebrity barista Abner Roldán – featured on the cover of the April/May issue of Barista Magazine. Easy to find, just in between Lote 23 and Abracadabra – next to Sidibou Restaurant on one side and a planned micro-brewery in the location of the old Godfather restaurant. 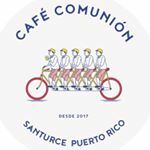 Stop by from Monday – Saturday for the hottest hangout in Santurce and check their Instagram and Faceboook pages for special events like their recent ‘pop-up’ breakfast with Chef Wilson Davalos of CLMDO restaurant in Isabela, PR.